Couple of retro(ish) road projects coming up for me. Long story but try this. i'll get in quick with the d2! 9speed record mostly, tune rear hub, coda front, matching ano orange open pro rims, has matching millenium post now aswel, rides really nice and is pretty light. When I have some spare cash the 'Beer Scooter' is getting a make over, full respray/powder coat, dual pivot brakes (not retro, but I like to actually stop when I pull the brakes) will thoroughly clean the 600 Arabesque mech's & shifters and a nice chainset too, would like to try a Brooks saddle on it too. Old Ned needs to get posting in this thread I think. Not exactly a roadbike, but if it belongs to any place it belongs to this place: I got my hands on a GAZELLE Champion Mondial trackbike yesterday. Beautifull handmade in Holland white 531c frame, Campa NR Pista hubs and cranks in very good shape - very nice Hope to have pics up soon. I am chuffed to bits with this frame. The seller says it was made as a one-off for him in '93 by none other than Steve Wade - that the original owner used to ride with Wade was confirmed by none other than our own Cannondale King...! I'm afraid I am going for a sympathetic build rather than a full-on retrobike - I intend this to be very much a rider, and something I'll use in bad weather so no esoteric bits, just functional and dependable kit. I've got 9-speed Dura Ace downtube shifters and vintage Dura Ace brake levers (spring return aero ones, beautiful). 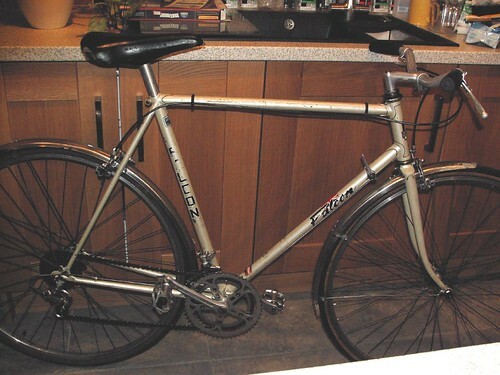 I've bought a NOS Syncros roadie stem / seatpost and a Shimano factory wheelset. 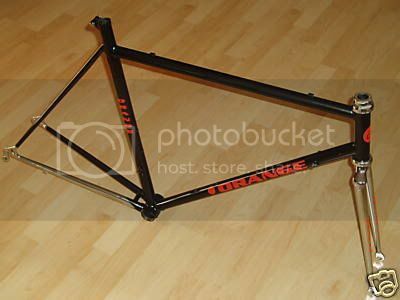 I'll probably end up with a Nitto bar and a Flite saddle, the rest of the stop-and-go stuff is likely to be Ultegra from when 9-speed first came out. Getting it to the UK was a bit of an ordeal and since I took ownership of it I've done nothing with it apart from buy a Nitto Pearl stem. 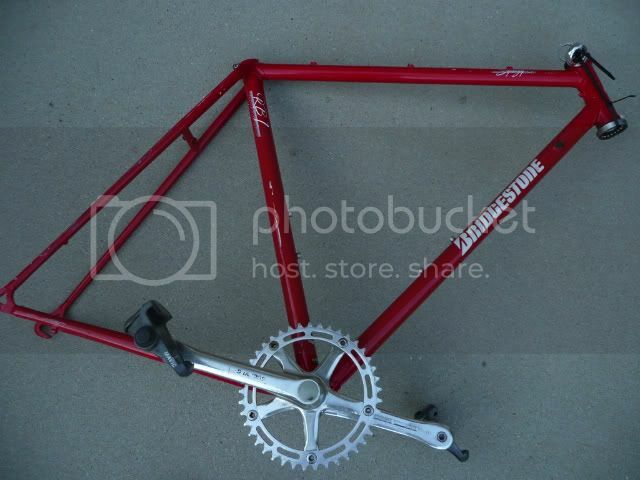 I bought it to build it into a single-speed road bike and I was going to remove its gear hanger and downtube mounts, but now I've got it I don't have the heart to do it. I was looking forward to giving it a pearly white paint job too but I don't have the heart to do that either.